Heat oven to 400°F. Spray large cookie sheet with cooking spray. Unroll dough on cookie sheet; press into 15x10-inch rectangle. Brush with melted butter. Bake 12 to 15 minutes or until deep golden brown. Crumble cheese, and sprinkle over baked crust; let stand 2 minutes to soften cheese. Spread cheese evenly over crust. 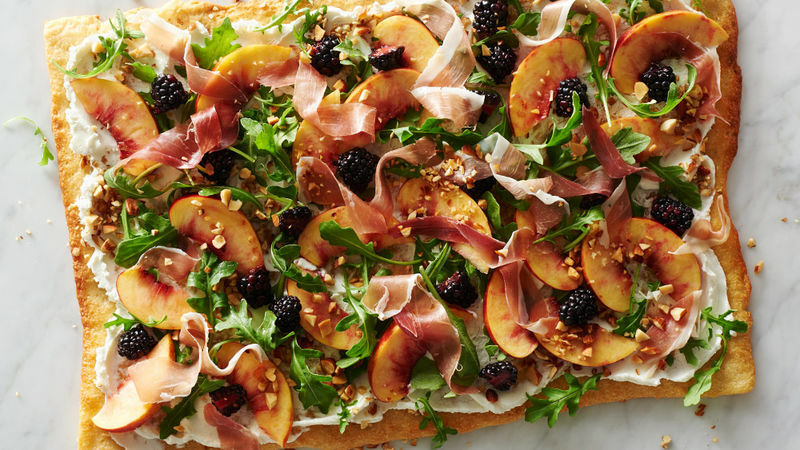 Top with arugula, then nectarine, blackberries, prosciutto and almonds. For best ripe flavor, seek out a nectarine that gives a little when pressed on the side with your thumb. Feel free to experiment with your favorite stone fruits and nuts.